Have you ever wanted to do little else but knit with friends? Have you wanted to enjoy breakfast and then knit, savor lunch and knit some more, feast on dinner and knit knit knit? If you’ve said yes, then a Guild retreat is for you. Knitting outdoors at the Temecula Retreat. 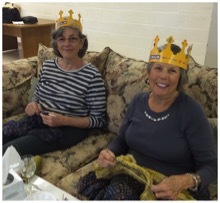 Diana Rathbun and Sara Stolz enjoying retreat knitting. The Guild sponsors two retreats each year, one in January and one in spring or summer We go away to beautiful, quiet places where we knit and nap, take walks, have massages, get to know our knitting friends and knit some more. We cast on new projects and finish long-unfinished projects. We share knitting stories and knitting needles. In winter and summer our retreat location is the lovely Viña Lestonnac Retreat Center in the middle of the Temecula wine valley. 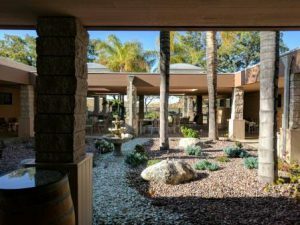 Previous spring retreats have been at La Casa de Maria in Montecito and Mary and Joseph Retreat Center in Palos Verdes. 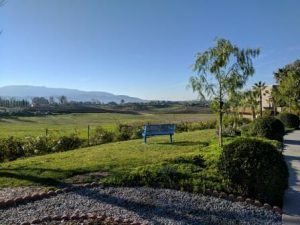 Read A RECAP OF THE JANUARY 2019 retreat here. View a video of the August 2018 Retreat Here. View photos of the May 2018 Retreat here. VIEW PHOTOS of THE JANUARY 2018 RETREAT HERE. View photos of the January 2017 retreat here. View Photos of the January 2016 retreat here. Peninsula view near Mary & Joseph Retreat Center.